I went into one of the big box stores yesterday looking for gift bows to use on my Christmas gifts. I could not believe the price for a bag of gift bows, even on sale. And I would not call them pretty bows. So I started looking around for something I would want to use on my presents. 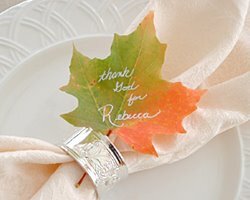 There are tons of gift wrapping ideas out there, but I want something I could just stick on and go. I found these easy to make felt bows from See Vanessa Craft. The cost less than .20 cents a piece and are reusable. It took me less than 2 minutes to make one and if you assembly lined the project it would even take less. Felt comes in many different colors, even some with sparkles! And this is my sample I made this morning from felt I had in my stash. I love this bench cover that I found over at CSI Project. 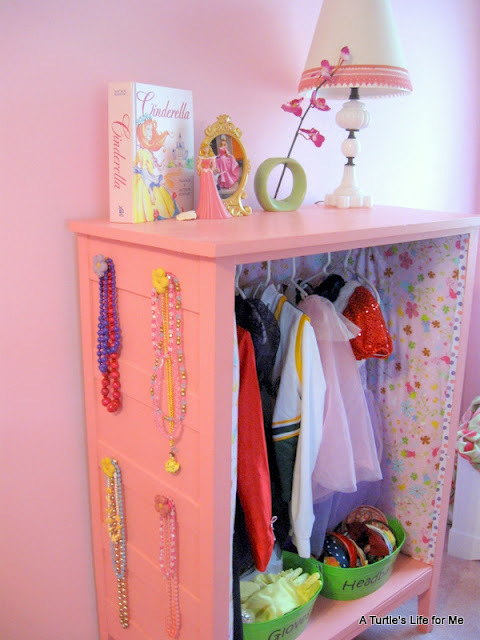 It is a guest blog from Pretty Handy Girl. The cover is made out of a shower curtain for easy cleaning. Check out both blogs for a lot of other great ideas for the home. 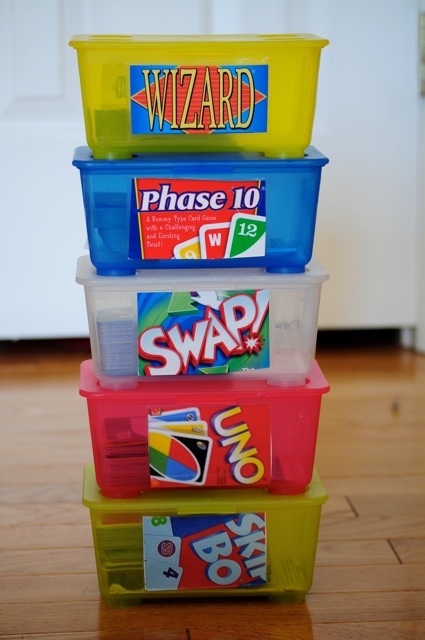 Here is an other DIY project from Breakfast for Dinner. I have an island counter that I would really like to change, but think I will give this a try on a small-scale and make sure I get the results I am looking for first. This morning I found this tote bag on Etsy (an online market place for homemade and vintage items) and I just had to share. It is now on my Christmas list. It’s by Kimberly at Homemade & Craft. Today I have found a hodge-podge of ideas. 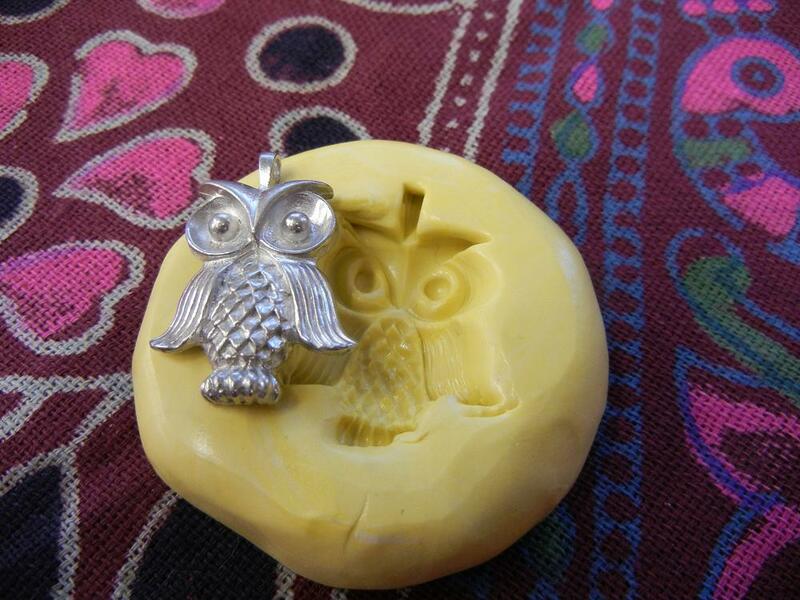 The first is a product that lets you make your own mold, and it is food safe. You can see how it works at Rings & Things. 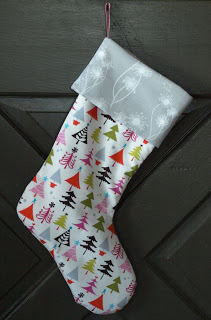 Fabric Worm has a wonderful tutorial for making a Christmas stocking. You can dress up this basic design in may ways. 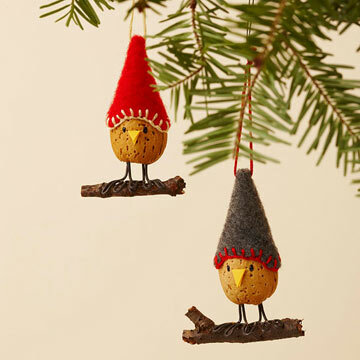 These birds made out of almonds would be fun to do with the kids. You can find them at Better Homes and Gardens. 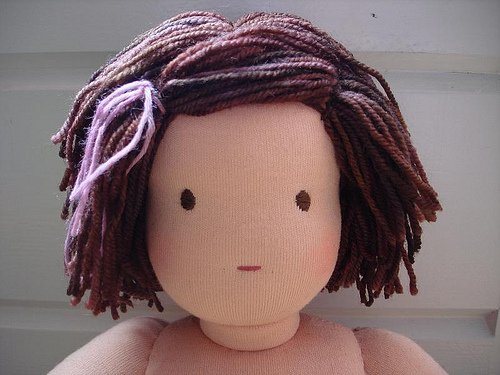 And over at Crafty Sheep she will show you how to make doll hair. Easy to follow instructions. Well I took you many different directions today, hope you find something useful, and happy crafting. 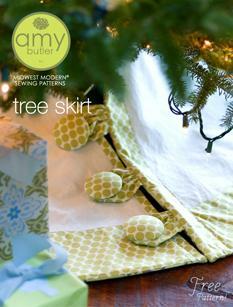 I may not get it done this year, but this tree skirt from Sew Mama Sew is on my list for next year. It screams Marla and the one I have now is in pretty poor shape on top of the fact that my husband doesn’t like it. 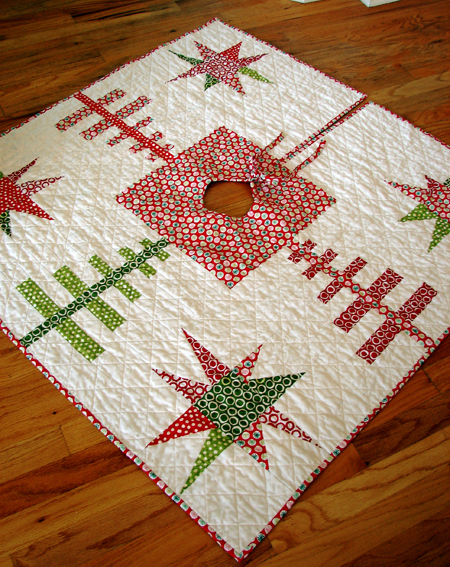 Amy Butler has a free download for this Christmas tree skirt. I love the big buttons. This skirt can adapt to any Christmas design by just changing up the fabric. And for those who aren’t interested in sewing (there is a little bit), here is a skirt made of felt from Better Homes and Gardens. 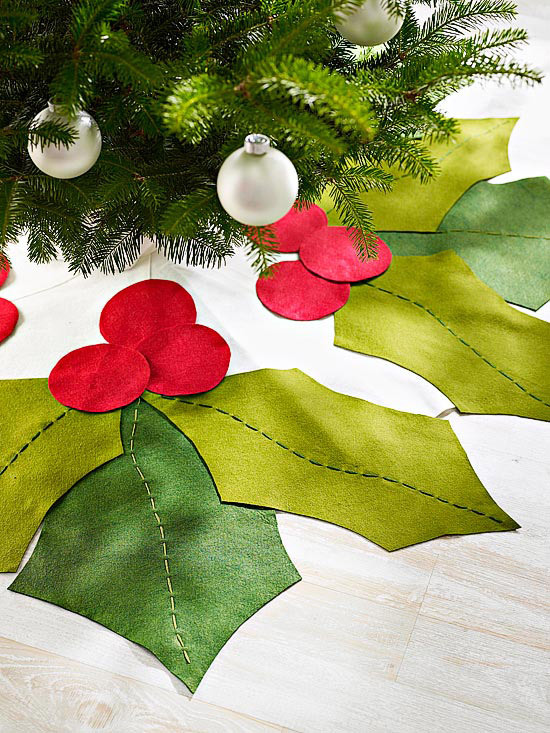 Crafty Talk has 11 ideas for tree skirts. Some of which are no sew patterns. 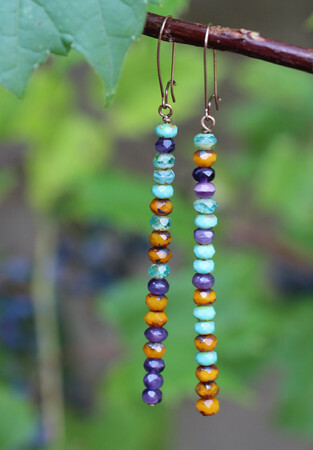 I love the colors in these brush stroke earrings by Lima Beads. I like how she changed the colors for each earring. 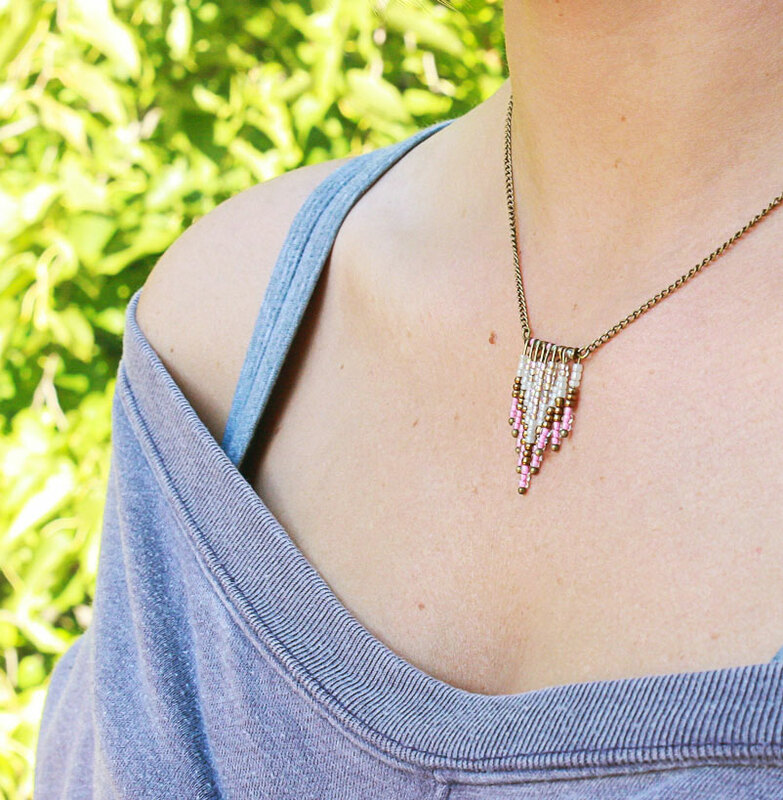 The chevron design is so popular now and this necklace from Craftpond really shows it off. 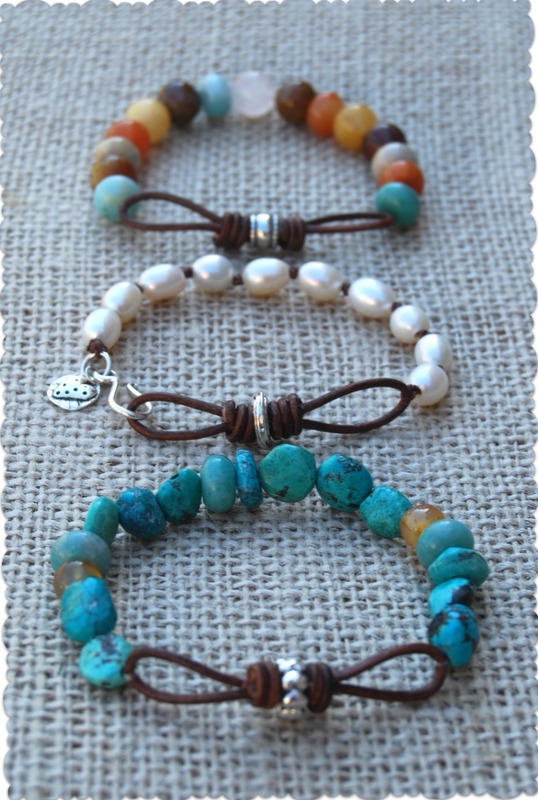 Look at these great infinity bracelets from Make Bracelets. They have stretchy cord in them! Makes them easy to get on and off. So my tips for jewelry making are to go to the bead shop with a project in mind. Lots of wonderful beads there, really easy to come home with beads just because they are pretty. Work at get a technique down makes a difference in the finished piece. Using proper tools will give you a better finished look, you can get by with about three different tools and are often sold as a set. (not expensive) There are many blogs that have jewelry making tutorials and give great instructions on finish work, Katalina Jewelry is a good one. And remember the person you are making the piece for, they may wear only dainty jewelry so that big bright-colored piece you worked so hard on may not get worn.